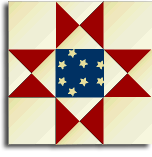 As part of an ongoing program throughout the Applachian counties of Southern Ohio is a program called "Clothesline of Quilts in Appalachia." The idea began with Donna Groves from Adams County. She had purchased a barn that had the Chew Mail Pouch Tobacco sign painted on the side. These tobacco signs were quite common throughout the midwest and a few of the old painted barns still remain. However, some people weren't quite as endeared with this form of folk art and were looking for something different to do with their barns. Thats where Donna Groves made the improbable decision to paint a patchwork quilt pattern on her barn. What could be more country than a patchwork quilt? In doing so, Donna not only created her own touch to the Ohio country side, but she also did it to honor her mother who was a quilter as was her grandmother. In time, money was provided by the Ohio Arts Council and local communities to paint a variety of 8' x 8'patchwork quilts on local barns. Not only are these large patchwork quilt patterns unique, but they are also bringing urban dwellers into the countryside to find these pieces of art. A number of counties have joined the movement of creating these patchwork quilt patterns. Each county is going about painting the squares in their own way. Scott Hagan, who painted the 88 county barns with the 2003 Bicentennial logo, is helping paint a number of barns in Monroe County. The following is a listing of counties that are participating in this project.